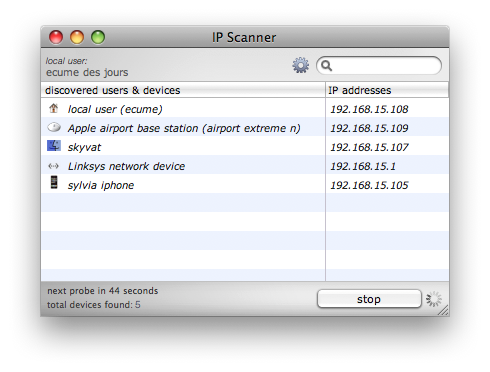 [prMac.com] IP Scanner is the premier "easy-to-use" network scanner for the Mac, and it just got better. Rebuilt from the ground up for Leopard, IP Scanner 2.0 surpasses its predecessors in every way. Coupled with the latest Mac OS release, it is faster, more stable, and uses far fewer system resources than version 1.7 (and it runs great in Tiger as well!). New device categories have been added to its scan routines, and a handy new "tools" button allows quick access to the inspector window and common tasks. Best of all: IP Scanner 2.0 is still free for personal networks, and is a free upgrade for existing corporate customers. 10base-t interactive is a collective of multimedia professionals who are both technologically adept and creatively inclined. Our core staff comprises; Mark McCray: database architecture, Paul DeGeorges: interface design and servers, Eric Redlinger: networking/low-level coding, and Trystero Montevideo: support and public relations.